Sidak is the Sikh Research Institute’s annual two-week leadership development retreat in the Hill Country of San Antonio, Texas. Attendees choose one of three tracks of study: Sikhi 101, Sikhi 201 or Gurmukhi 101. There are also group sessions daily where all three groups come together for presentations on leadership styles and techniques, as well as discussions on developing healthy, positive, interpersonal relationships and finding ways to develop individual talents and passions through community service. This year, Sidak will be held from June 25 through July 9, and spots are still available. For more information, including what you need to get an application started, please visit: http://www.sikhri.org/sidak-training-development.html, e-mail us at sidak@sikhri.org, or check out our videos here and here. We’d like to share two stories from a past Sidaker, to let them tell in their own words what the Sidak experience could mean for you. It is a rarity to find mentors and teachers who will provide a spark to an inquiring mind. I have found that my experiences at Sidak have led me to seek a better understanding of my faith. The spark I received at Sidak was the beginning of a journey. I set out to learn as much as possible about Sikhi and Gurbani. I wanted to learn about the social and political issues affecting us as a people. From human rights abuses in Panjab to civil rights issues in the diasporas, it is imperative that we become cognizant of the issues affecting us. Once we gain awareness, hopefully we can begin the process of addressing these issues. Education is the first step and that is what the programs at Sidak provide. In the year following completion of the Sidak program, I was able to help develop lectures and small group discussions for a national Sikh conference. I attended the Sidak program twice in the summers of 2006 and 2007. Three years later, my brother and I still have weekly Gurbani vocabulary quiz sessions. Sidak was a life changing experience. There are very few programs that can provide a positive influence on one’s life. I am extremely grateful that I had the opportunity to learn at Sidak and I hope others are able to share my experiences by attending Sidak. The Gurmukhi track at Sidak 2009 is a very structured course whereby high school and college students and adults with either minimal Gurmukhi skills or with fluent modern Punjabi written and spoken skills (or anywhere in between) can learn to translate Gurbani. Two weeks is hardly enough time to learn a language, but the Gurmukhi track at Sidak is presented through detailed course materials, and supplemented with the tools and techniques to help you continue your journey to discover the Guru Granth Sahib Ji for yourself with self-study afterwards. The instructors at Sidak 2009 were excellent, and they used well-developed course materials to transfer their knowledge to students who came from a wide variety of backgrounds. The proof of their effectiveness of instruction is in the fact that I saw young adults with minimal written and spoken modern Punjabi skills translating shabads on their own in a span of two weeks. The instructors were knowledgeable and passionate about teaching. However, the course is rigorous and has ample homework and it is definitely not for the meek or timid, I think. If you are serious about learning the Gurmukhi used in the Guru Granth Sahib Ji then Sidak is the only place that I know of that will offer the depth and scope to help you extrapolate your existing English and modern Punjabi, or other language skills, to understanding Bani with parts of speech, vocabulary, and techniques of grammar. The Gurmukhi track at Sidak is unique in that it caters to a diverse audience – those that already are or aspire to become highly accomplished as professionals in field as diverse as engineering, medicine, social studies, psychology, computers, mathematics and law. Students and professionals from almost each of these fields attended Sidak 2009 and student’s ages ranged from late teens to mid-thirties. The Sidak Gurmukhi track enabled me to leapfrog my understanding of Gurbani from that of a green novice to becoming adequately equipped with tools and techniques to continue through self-study. I am thoroughly impressed by this course and wholeheartedly recommend it for every Sikh and non-Sikh who wishes to learn, translate, and understand Gurbani for themselves. If you are of the mindset that the ancient Gurmukhi of our Gurus that is comprised of a multitude of languages is a rare art form that a select few “back inIndia” could have the privilege of learning properly, then you are in for a pleasant surprise. The Gurmukhi track at Sidak reveals the art and science of Gurmukhi and makes Gurbani accessible to you, even if you do not practice using modern Punjabi in your daily lives! If you have just the desire to learn the word of the Guru Ji in Guru Granth Sahib Ji, then you will come out of this course with enough knowledge, tools and techniques, and literature references to start your journey towards discovery of Dhur Ki Bani by yourself. 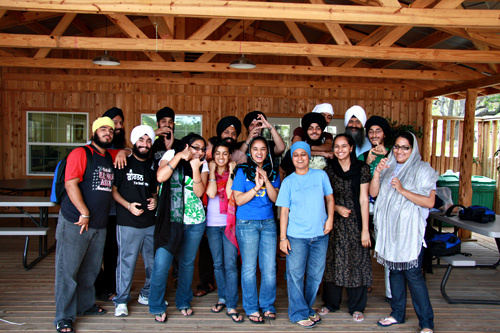 Established in 2003 and located in San Antonio, Texas, U.S.A., SikhRI (http://sikhri.org/) is a non-profit, faith-based initiative whose mission is to “facilitate training and development while inspiring Sikh values, create global awareness of Sikhi, and deliver solutions to the key challenges faced by the Sikh community. This entry was posted on Wednesday, May 4th, 2011 at 2:16 pm and is filed under Uncategorized. You can follow any responses to this entry through the RSS 2.0 feed. Both comments and pings are currently closed.